Five minutes ago I put down my copy of Go Set a Watchman in a state of, well, loss but also amazement. To Kill a Mockingbird is without a doubt one of my favourite books ever. I fell in love with it as a sixteen year old and it sparked a love that not many other books have. I’ve been worried about reading it because of all the controversy in the news but I had to read it anyway, it’s a sequel to a novel I’ve treasured for years. While there have been numerous bad reviews of the novel, this will not be one. Is this novel as polished as To Kill a Mockingbird? No, I don’t think so. I also think that the negativity is because of what people wanted to read. They wanted the world to be free from racism and for Scout to still be the lovable kid we first read about. The difference is that Scout, now called by her real name Jean Louise, has grown up. She’s twenty-six years old and a lot has changed for her. She no longer had older brother Jem and her best friend Dill to rely on (something which initially upset me but made sense at the end of the novel) and has to make her own sense of the world. Before long and reader familiar with Lee’s work falls into Maycomb again. While 20 years have passed, it seems to Jean Louise Maycomb has stayed frozen in time. She’s still told off by Aunt Alexandra for not being as feminine as she should be, which made me laugh. While the sleepy town is the same, the reader is introduced to Henry, a Maycomb County boy, Atticus’s law partner and Jean Louise’s on, off love interest. The relationship between the two characters is vital to the plot and to Jean Louise becoming who she is at the end of the novel. There has been a lot of controversy about Atticus, people have screamed about him being racist and letting go of everything he stood for in To Kill a Mockingbird. I don’t want to spoil the novel, but I do want to say wait. Read the book before you get mad and start ranting. If you start reading and want to throw it at all wall, carry on because I promise you there is a reason for this, a reason that is vital for Scout to grow into JEan Louise. I could not put this book down for the life of me. I needed to read it, even when I was frustrated or didn’t understand (there is a lot of historical knowledge that I wasn’t too sharp on) I needed to get to the end. I found that I really connected with Jean Louise, she will always be Scout to me though. I just felt what she was feeling, when you go back to your hometown and you just feel like you stick out. When you need to realise that ultimately, everyone is human, even if it hurts. Aside from the heavy parts of this novel, some of which had me on the edge of sobbing my heart out, there is laughter. The novel gives us glimpses of our favourite trio growing up. It felt almost like a comfort blanket reading about Scout, Jem and Dill and the things they got up to after that eventful summer, as well as who they grew up to be. I thought long and hard while reading about how I was going to rate this and what I thought of it. While reading the majority of it I had a solid 3 star review in my head, and then I got to part seven, which changed everything. It explained what I needed explaining and made me think about my own life. I have to give it to Harper Lee if she can take credit for anything it’s making people think. I want to give the novel four stars ****. Before people question it, let me just say there was something in this novel that caught me. Jean Louise is only six years older than me and I felt a connection with what she see’s and how she tries to make sense of the world around her. Lee has taken To Kill a Mockingbird and shown us again that life isn’t clearly divided into good and bad, black and white. 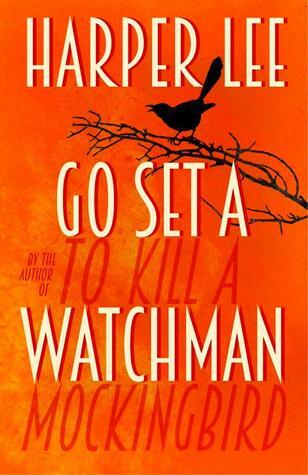 I think for anyone who loved To Kill a Mockingbird, Go Set a Watchman is a must read, especially for those of us at a confusing time in our lives. Why do I blog? Two years on and what started it all.